So far in this blog, I’ve written far more on the topic of bytes than books! This is mainly due to the fact that I was trying to finish SLL2.0 before school started, and its focus is technology. It’s also due to my interest in EdTech issues. In fact, I have to make a concerted effort to not let the “bytes” part of my library program overtake the “books part! My EdTech bent is one factor, and the curriculum of our district, the focus on information rather than literature being another. I don’t think this is necessarily a good trend in education & school libraries, however it is the current climate in Texas. Today is a Books post though! Hooray! A colleague of mine and I are planning an author visit in November for Children’s Book Week, and I’m excited about it. I will be hosting only one author this time, while my friend has about 10 different authors and activities planned! That’s a big job! I did that a couple of years ago when we had Carole and Bill Wallace visit our school, but thankfully it’s a bit more low-key in my world this year! 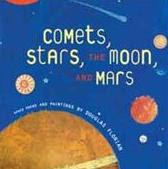 This year, we will host science writer Elaine Scott in our schools. Elaine lives in Houston, so we are lucky to have her right in our back yard! A savvy writer, Elaine is one of the first children’s authors to have jumped on the whole Pluto development! I can’t wait to order and read her newest book, just published this month. It’s called When is a Planet Not a Planet? It’s gotten very good reviews, and I have been very pleased with the other books in our collection by Scott. So this one should be a great, and much needed addition to our astronomy collection. Scott’s last book, Poles Apart, filled in that little piece of information that children (and teachers, sometimes) seem to miss so often: penguins and polar bears don’t live in the same place! My students love that book, and we have multiple copies. Penguins are always a popular topic, as any school librarian might tell you, and so are polar bears! It’s a great book–highly recommended. By filling in these fascinating bits of information for our students, Scott shows her savvy. She’s a good, personable presenter too–I saw her at ALA last year. So I can’t wait to host her at our school! Should be a good day!